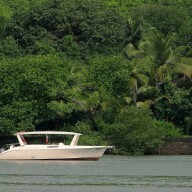 Relax and unwind over a one-hour cruise over the tropical, blue waters of the Chapora River in Goa. From a jetty in Morjim, you'll board a palatial cruise yacht and head inward along the Chapora River. With the cool breeze in your hair, you'll explore the aquatic jungles and mangroves that crowd the shores of the Chapora River. On board the cruise, you can sit back with snacks and beer, to some gorgeous views of the river. NOTE: A minimum of 4 travellers are required to book this Chapora River cruise in Goa. Popularly known for its soft, sandy beaches with palm trees, Goa is packed with a rich and diverse aquatic landscape. Rivers like the Chapora flowing down to the Arabian Sea are lined with sprawling rainforests of chirping birds and wild animals. Drift down the Chapora River on a cruise boat and get the complete sun, sea and sand experience of Goa. • Go on the Chapora River cruise in Goa. • Explore the rich jungles and mangroves along the river. • Unwind and relax on the cruise boat. Travellers are required to adhere to the instructions of the tour guide during the Chapora River cruise in Goa. Consumption of drugs is strictly prohibited during the Chapora River cruise in Goa. For cancellations made 45 days before departure of the Goa cruise: 100% refund. For cancellations made 30-45 days before departure of the Goa cruise: 75% refund. For cancellations made 15-29 days before departure of the Goa cruise: 50 % refund. For cancellations made less than 15 days before departure of the Goa cruise: No refund. Boarding time for the cruise begins at 06:00 hrs, with last boarding at 16:00 hrs. Based on the alloted/selected time slot, to be confirmed with the tour operator at the time of booking, travellers are requested to arrive at least 30 minutes prior to boarding. Children younger than 3 years are not charged. Children between the ages of 3-7 are charged at a discounted rate of INR 500 per child. Children older than 7 years are charged at full price. Travellers are allowed to carry limited snacks of their own on board the cruise, only if the tour operator is informed at the time of booking. The tour operator takes utmost care to ensure safety of the travellers and shall not be held responsible for any mishap or accident during the Chapora River cruise in Goa. There is no pick-up for this Chapora River cruise in Goa. There is no drop-off for this Chapora River cruise in Goa. Board the Chapora River cruise and enjoy! Arrive at the jetty office in Morjim and board the Red Mangrove cruise. A tour guide will hold a short briefing session on board the cruise before beginning the 1-hr session. The boat will smoothly sail accross the beautiful Chapora River with gorgeous views from onboard the cruise. The cruise will dock back at Morjim in an hour. Your trip ends here. Today's meal package includes snacks, soft drinked and limited beers available on board the cruise. You'll also be served a welcome drink upon arrival. If you'd like to carry your own snacks or beverages, please inform the tour operator at the time of booking. Your trip ends after a 1-hr river cruise in Goa. Relax and unwind in the Red Mangroove cruise. The jetty is accessible via road from the Goa International Airport, located 50 kms away, and the Pernum railway station, located 15 kms away. You can board a flight to the airport or a train to the railway station and travel to the jetty via hired car/taxi.